The Bayeux Tapestry was probably commissioned to decorate the new cathedral of Bayeux in the 11th century. The inventory of the cathedral Treasury, dated 1476, includes the Tapestry in the list of artefacts. Its use is described in this inventory as a Church item. The embroidery telling the story of the conquest of England was hung in the nave once a year and kept in a wooden chest in the vestry the rest of the time. The masterpiece thus remained in the Bayeux cathedral for seven centuries, almost unknown. No other document mentions it until the beginning of the 18th century. After the Revolution, in 1794, the Arts Commission for the Bayeux district seized it on behalf of the Nation, thereby ensuring it was protected. According to a well-established local tradition, it was almost cut up in 1792 to make covers for soldiers’ carts, but luckily was saved by a local lawyer, Léonard Lambert-Leforestier. 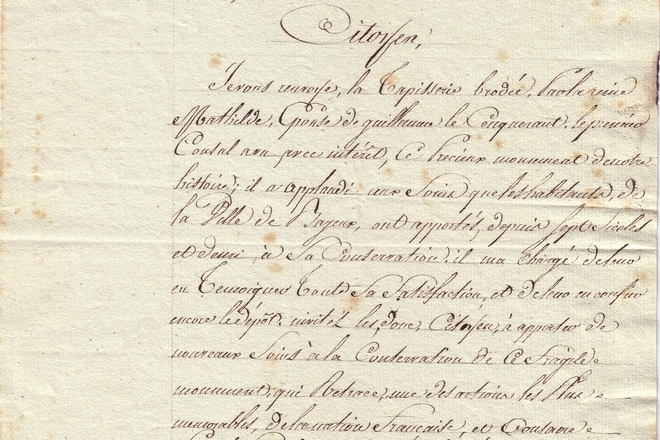 At the beginning of the 19th century, the Interior Minister requested on 23 Brumaire, year XII (15 November 1803) via the Prefect of Calvados, that the Bayeux Tapestry be sent to Paris to be shown at the Napoleon Museum for a few days. The Tapestry was sent by stage-coach and then displayed in the Apollo Gallery at the Louvre from 6 December 1803 to 18 February 1804. Did Napoleon Bonaparte see it as a propaganda tool as he was preparing to invade England? 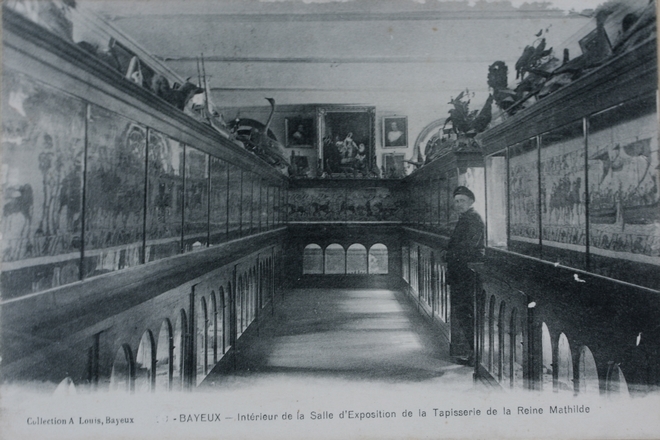 From 1812 the Tapestry was kept in the Hotel de Ville (city hall) in Bayeux. It was generally hung and displayed to the public in September of every year. In addition, the custodian could show it to visitors, rolling it out gradually on a table by turning the crank handle of a winder: this way of exhibiting it was described on several occasions by British writers between 1814 and 1836. From 1842, it was put on permanent display for the first time in the Matilda gallery.